Delicately infused with patchouli & lavender fragrance to help relax the mind & help soothe a tired body. As you bathe in the gentle waters of the outdoor hot tub, wood crackles nearby on the open-air fire and the mood is one of complete well-being. Calcot Spa is not about gimmicks, just wonderful facilities and classic treatments delivered to the highest standards by a team of professionals. It is said that sleep is what ties our health and our body together. We hope our Beautiful Sleep range will help you relax and that every tomorrow arrives with a whole new light. This product has not been tested on animals. We fund research into alternatives. Sprinkle into a warm bath for a gentle, unwinding scent to help relax your mind at the end of the day. 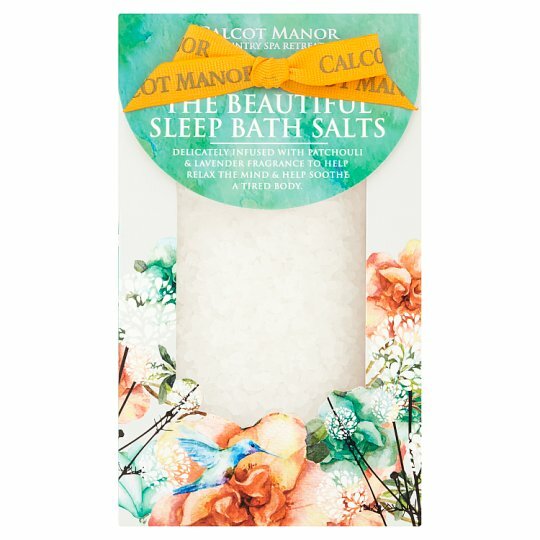 Allow the bath salts and your mind's thoughts to dissolve. Warning: Avoid contact with eyes. In case of contact, rinse immediately with clean, warm water. Do not apply to broken or irritated skin. Discontinue use if irritation occurs.